Ven. Chodron introduces a new book by His Holiness the Dalai Lama and Ven. 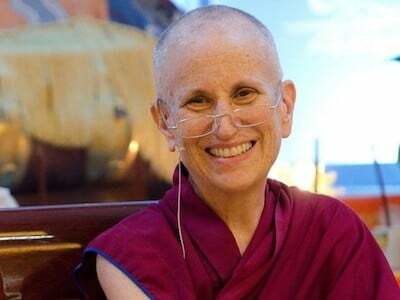 Thubten Chodron, Samsara, Nirvana, & Buddha Nature. It is the third volume in their The Library of Wisdom and Compassion series. Buddhist teachings give an honest assessment of our current life. We face seemingly endless problems, which all begin in our mind. At the same time, we have unlimited potential to bring peace and balance to ourselves and the world. Samsara, Nirvana, & Buddha Nature weaves together personal stories and insights in a way that can help us unlock our potential if we bring an open mind and willingness to look within. 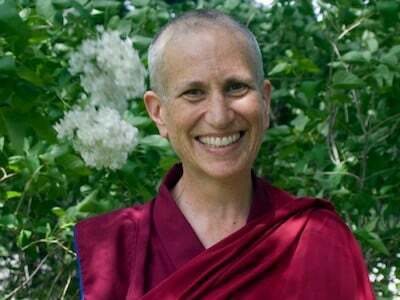 Venerable Thubten Chodron is known and respected around the world for her skillful explanations of Buddhist teachings. Don’t miss this special opportunity to listen to one of the leading minds in Buddhist scholarship and practice. 7 pm – 9 pm, American Evergreen Buddhist Association Chi Yuan Temple, 13000 NE 84th Street, Kirkland, WA. Organized by Dharma Friendship Foundation. Contact info [at] dharmafriendship [dot] org. 2018 Annual Report is Here!